Information Days help potential bidders to understand better how Europe contributes to ITER and the scope of the tenders in the pipeline. F4E representatives having a technical and business background explain what components need to be manufactured and their degree of complexity. The various tender procedures that F4E applies and the contractual conditions are also presented. Visiting the location where the components need to be installed and delivered also matters. It gives a more precise understanding of the nature of the work and the cost. 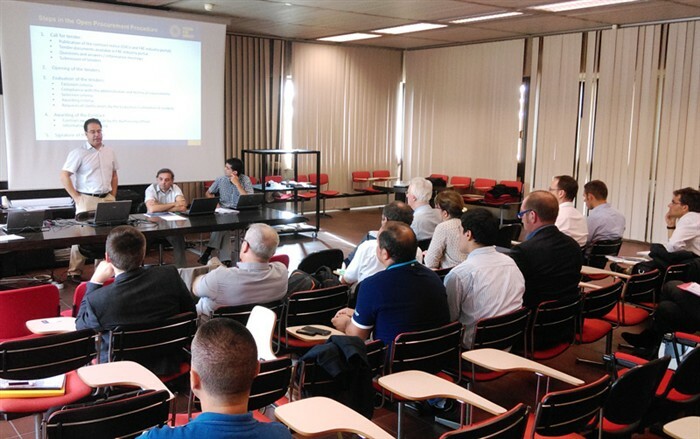 This is why F4E organised an Information Day to Padua, Italy, where the MITICA experiment will be carried out. Representatives from seven companies responded to this open invitation to become more familiar with the project and its requirements. F4E together with the ITER Domestic Agencies of Japan and India, and in collaboration with Consorzio RFX, are contributing to a test facility called PRIMA, whose main objective is to test the full-size prototype of the ITER neutral beam heating system. This facility will host MITICA, a first full-size and full performance injector that will require the supply and management of a considerable quantity of SF6 gas. The objective of the Information Day was to go into detail about the gas handling and storage plant that needs to be installed. Francesco Paolucci and Eduard Bragulat from F4E’s Neutral Beam and EC Power Supplies and Sources team, together with Marco Boldrin, from Consorzio RFX, explained the technical requirements and guided the representatives of the different companies during the onsite visit. Jorge Caballero and Benjamin Perier, following the procurement and business angles respectively on behalf of F4E, elaborated on the tender procedures and the commercial aspects of this contract to help companies working in this niche market to respond to the needs of F4E.